Frey's procedure is a surgical technique used in the treatment of chronic pancreatitis in which the diseased portions of the pancreas head are cored out. A lateral pancreaticojejunostomy (LRLPJ) is then performed in which a loop of the jejunum is then mobilized and attached over the exposed pancreatic duct to allow better drainage of the pancreas, including its head. Frey's operation is indicated on patients with chronic pancreatitis who have "head dominant" disease. 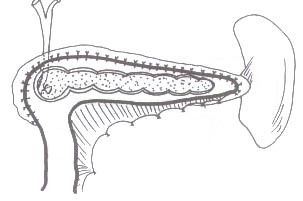 Compared with a Puestow procedure, a Frey's procedure allows for better drainage of the pancreatic head. Postoperative complications after LRLPJ are usually septic in nature and are likely to occur more often in patients in whom endoscopic pancreatic stenting has been performed before surgical intervention. Pancreatic endocrine insufficiency occurs in 60% of patients. It is named for the American surgeon C. F. Frey, who together with G. J. Smith first described it in 1987. ↑ Gourgiotis S, Germanos S, Ridolfini MP (2007). "Surgical management of chronic pancreatitis". Hbpd Int 6 (2): 121–33. PMID 17374569. ↑ Chaudhary A, Negi SS, Masood S, Thombare M (2004). "Complications after Frey's procedure for chronic pancreatitis". Am. J. Surg. 188 (3): 277–281. PMID 15450834. doi:10.1016/j.amjsurg.2004.06.012. ↑ Frey, CF; Smith GJ (1987). "Description and rationale of a new operation for chronic pancreatitis.". Pancreas 2 (6): 701–7. PMID 3438308. doi:10.1097/00006676-198711000-00014. Frey's procedure (drawing) - Bombay Hospital Journal.